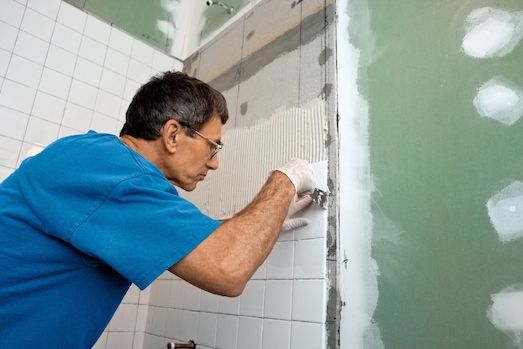 Getting the chance to remodel a bathroom is an exciting prospect. Whether you’ve been making do with your old bathroom for years and are finally tackling the bathroom remodel or just moved into a new home and are ready to change the bathroom right away, now you get to create the modern bathroom design you’ve always wanted. You’ll pick the floors, the walls, the shower, the vanity, all in order to give yourself the beautiful, functional space that makes daily routines more enjoyable. Before shopping for sinks and bathroom faucets, however, the first thing you’ll want to do is often the hardest — find a good contractor. In terms of home remodeling projects, finding the right general contractor is one of the most important — yet often most difficult — parts of the job. How do you know who’s trustworthy? Who will get the job done right? Are there certain qualities to look for when you’re exploring potential hires? Have strong references: Listen to recommendations from your friends, read reviews online and ask for references from anyone you consider hiring for a job. When a contractor is reputable, he or she should be able to provide a list of past clients, as well as glowing testimonials. On top of the references your contractor provides, however, also do your own due diligence by looking at your state’s consumer protection agency and the Better Business Bureau to see if any outstanding disputes (warning signs) exist. Communicate clearly: Save yourself the headache of never knowing how the project timeline has changed or what new expenses have come up, and pick a contractor who makes communication a priority. You can test this quality both by talking to past clients and by paying attention to the way the contractor deals with you upfront. What’s the payment schedule, for example? What kind of timeline gets discussed? Are your agreements in writing or done on a handshake? If your contractor is willing to take initiative to clearly communicate with you now, that’s a good sign. Listen. Just as important as being able to communicate about changes and updates is being able to listen. A contractor who takes over a job without checking in with a client is not a contractor you want to handle your bathroom remodel. This, too, is a quality you can look for in initial meetings and in past client’s reviews. Hold appropriate licenses and insurance: Ask to see the contractor’s proof of licensure and insurance before starting any kind of project together. These qualifications are more than mere formalities; they protect you in case of unexpected injuries or accidents that occur on the job. Possess multiple skills. A general contractor needs a wide breadth of skills. More than just being able to lay flooring, he or she needs to understand what goes into plumbing, painting, electrical work, windows and more. Ask about competencies and pay attention to what skills each potential contractor has. You want a contractor who’s able and willing to handle any part of your project, as needed. Finding the right contractor can seem daunting, but when you know what qualities to look for, the process becomes a little simpler. Once you find the right person for the job, the next step to a winning modern bathroom design is finding products — so come to Modern Bathroom for the best prices, a large selection and free shipping straight to you! Redesigning a bathroom and like the look of the sea? Whether you live near the beach or just wish you did, you can create a nautical bathroom remodel simply by incorporating a strategic blend of colors, appliances and features into your space’s design. A nautical look is one of those bathroom themes that has had great staying power throughout changing trends. When you’re interested in a nautical look, give yourself permission to have fun! A cohesive theme: For the best complete look, explore different nautical bathroom themes and then pick one to use. Whether you go with images of whales, anchors or ocean waves, figure out what you want to emphasize most in order to avoid a cluttered feel. Likewise, pick a color scheme that you want to stick to and work all other design elements into that. Soothing, gentle colors: Hint at the soothing, calming colors of ocean waves by decorating your bathroom with soft blues, creams, whites, pinks and beiges. From the color of your walls to the color of your linens, stick to these shades for a cohesive, beach-themed feel. Deep-navy hues: On the flip side of the soft and soothing look, consider a bold color scheme of deep navy accented by crisp white or dark brown. This look is another great nautical option, alluding to the ships and navy blues linked with life on the water. Natural materials: To highlight the natural beauty of your nautical theme, stick to natural materials as much as you can in your bathroom design. Look for quality hardwoods that are unfinished or lightly finished — particularly those with a weathered look. Explore possibilities for bamboo or bamboo-like fixtures. 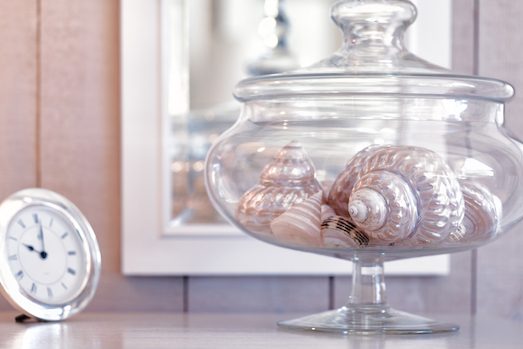 By incorporating natural elements like these, you reinforce the nautical vibe. Nautical accessories: Stamp your creative touch on your bathroom by selecting nautically themed shower curtains, window treatments, wallpaper, bath mats, towels, artwork and/or other accessories for your bathroom space. There are so many possibilities on the market today. The unique combination of elements you select is what will make the bathroom feel like your own. Just be sure to keep components in line with your maritime theme to accentuate the nautical feel. Decorating a bathroom is a great opportunity to showcase your style and call attention to parts of ocean life you love. Whether you keep everything understated with a few pictures of the sea hung on the walls or go all out with nautical colors, accessories and anchor-shaped hardware, you have plenty of options for customizing your space. Get inspired with the ideas above and enjoy the process. When you’re looking for bathroom features and fixtures offered at great prices with free shipping, come to Modern Bathroom. Search our online catalog to find all the elements you need for your nautical bathroom design. 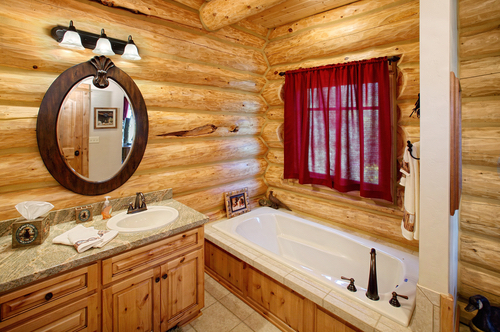 No log cabin is complete without comfortable, rustic bathrooms that reflect its cozy style. So whether you’re building a new log cabin or updating the baths in the one you already have, it’s important to think strategically about the fixtures you choose. From bathroom vanities to bathtubs to bathroom faucets, you’ll want to look for fixtures that complement the overall design and style of your log cabin home. To help you create a cohesive home design that incorporates the log cabin feel that you desire, here are some important ideas to keep in mind. Are you redesigning a tiny powder room or a large master bath? Before you pick any bathroom components, determine how much square footage you have to work with as you’re shopping for bathtubs, showers and other components. You may love the rustic feel of a certain vanity, for example, but your small space might not accommodate it. Everything from your bathroom sinks to your mirrors must be in proportion to the room. Remodeling a bathroom on your own can save you a great deal in terms of cost, but do-it-yourself projects aren’t for everybody. Evaluate how much needs to be done. Are you just replacing a vanity? Ripping out wall tile? Putting in wood wall paneling and sealing it properly? Ask yourself how comfortable you are taking on that task. If you’re looking at a small job or one that you already know how to tackle, you can confidently do it yourself. If, on the other hand, you don’t have the time and/or skill to do it yourself, it’s probably best to hire a professional. The prices of bathroom remodels vary greatly, depending on how much you’re changing, what products you’re buying and where you’re buying them, labor costs, etc. Based on your specific project, set a budget and stick to it. Likewise, shave your supply costs by shopping at Modern Bathroom, a supplier that saves you up to 70 percent and offers free shipping on everything we sell. To help you recognize the common themes in the log cabin look, explore log cabin websites, magazines and photographs for inspiration. Look for common elements: natural colors, greenery, photos or artwork featuring the woods. When you have a good sense of what defines the log cabin style, you’ll be better prepared to shop for new bathroom features. Decide what you want your bathroom to feature. For a log cabin vibe, you probably want wood tones, natural colors that are found outside (browns, tans, greens, blues, etc.) and textiles and accents that can create a cozy, rustic feel. Incorporating these components in the bathroom means choosing natural elements such as wood floors, wood walls, a natural stone shower and maybe a textured sink or accents of copper or iron. Explore options to see what works for you. You could even continue the unmistakable wood chinking that defines log cabins into the bathroom walls. When it comes to creating the log cabin bathroom you’ve always wanted, there are many ways to get creative. Use the tips above to guide your decision-making, and simplify the experience to maximize your enjoyment. Then, for the best products on the market, come to Modern Bathroom, browsing its web catalog of factory-direct products. Modern Bathroom is proud to be your best resource for all kinds of bathroom products, from bathroom vanities to sinks to bathtubs to mirrors. Visit either of our showrooms in California to learn more about what we offer, or explore our extensive online catalog and order online. We not only offer everyday low prices, but also provide a 110 percent price-difference guarantee: Find the product you buy from us at a lower price elsewhere within 30 days, and we’ll refund the difference plus an extra 10 percent. Search online now to see what we offer, or contact us today to learn more. In terms of creating resale value, updated bathrooms rank just below a new kitchen. Potential buyers want to see new bathroom sinks, clever bathroom storage, attractive bathroom vanities, new showers and bathtubs, etc. 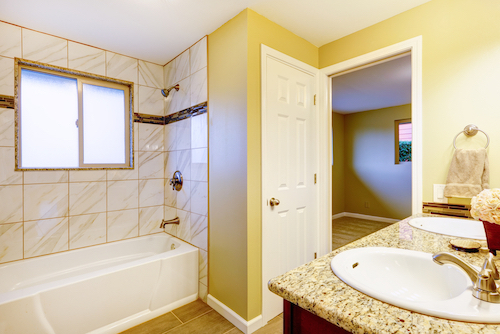 That’s why, if you’re planning to sell soon and want to maximize your asking price, a bathroom remodel makes sense. When you want to remodel for selling power, what are the most important upgrades to make? What should you keep in mind and how much should you spend? How can you cut costs for the best payback? To help answer these questions, here’s a look at tips to keep in mind when you want to remodel your bathroom for resale. How much you can expect to spend on a bathroom remodel depends on a variety of factors. Are you gutting the entire space and rebuilding? Are you just trying to add value to an already decent bathroom space? Look at your budget and decide what makes sense for you, whether that means replacing the toilet, the vanity and the shower door, or reworking everything from the ground up. As cool as invisible features like heated floors can be in the bathroom, keep in mind that buyers shop with their eyes first. When they look at listing photos or walk through your home, their first impressions will be based on what they see. If you’re trying to decide between brightening the bathroom or adding a new flushing mechanism to the toilet, go for the visuals. Focus on bathroom features like tile colors, wall colors, quality of fixtures and other components that will be easy to notice. When you take on a home remodeling project, it’s tempting to cater everything to your tastes. When you’re remodeling for resale, however, you aren’t remodeling for yourself. That’s why you need to think like a buyer. Rather than opting for the unique purple tile or that custom-made, quirky vanity, opt for mainstream design choices that will be likely to appeal to a great number of potential buyers. You can still pick items you like, but make sure you temper your opinions with popular design at the time. When in doubt, consult outside sources (like the experts at Modern Bathroom) for advice. You can’t go wrong with neutral colors, which create not only a clean, but also timeless look and appeal. They are easy to personalize with accessories and go with many styles. Look for whites, light grays and beige choices for designing your new bathroom. Because of all that gets done in the bathroom, storage space is at a premium. Buyers want to see that there’s room for toiletries, bathroom appliances, extra toilet paper, etc. If you can add a little convenient storage to the bathroom, it’s a good upgrade to make. Even a small bathroom can look bigger with the right design choices. Neutral colors, minimal features and fixtures in proportion to the space can go a long way toward making the most of your bathroom. Always think through the space you’re working with as you make remodeling decisions. A new bathtub or shower is a great feature, but before you spring for a replacement, determine if a repair job might be a better choice. Instead of totally replacing the bathtub, for example, could you have it refinished? Instead of putting in expensive tile in the bathroom, could you opt for a prefabricated model? Likewise, think twice before removing the home’s only bathtub to replace with a shower. While showers are great, they’re not as pet-friendly or family-friendly as a tub, so you may unintentionally turn some prospects away. When it comes to bathroom remodeling projects, Modern Bathroom is proud to be your top resource for products from leading brands! Buy factory direct from us, and you can save up to 70 percent on prices. We have two showroom locations in California, an online catalog, and we offer free shipping throughout the country. Plus, we have a low price guarantee! Search our website to learn more — or contact us today!